....they give me the whilly's!!!! Is this a problem that is all over the US? I dont know - but every year when the trees around here start blooming, you can see these little webs start forming! Ricky & I keep an eye out on our trees every year because you have to get ahold of them as soon as you see them, because you have to get rid of them or they grow, FAST & they can damage & kill your tree. I cant tell you how many times I've looked out & said, I see one & I have to point it out to Ricky so he knows where to spray at.... & I tell you what, its crazy because the next day, there will be another two or three starting up! Exactly the reason you have to get them right away! Ricky's good about killing these little monsters! Driving down the express way, there are hundreds of beautiful blooming trees everywhere. 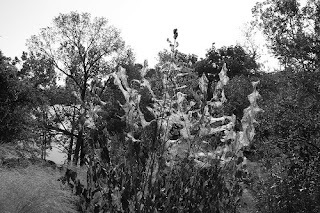 But you can see trees that are COVERED in bag worms. These trees do not get treated - & you can tell, when the other trees are fully bloomed & ready for summer, these trees are damaged, not as beautiful as they should be. But it really struck me this morning driving down seeing these trees covered....how if we don't take care of sin in our lives, how it can keep growing, how it can kill us, leaving us where we wouldnt bloom as beautiful as we should be able to! How it can kill parts of us that have a hard time recovering! How nasty it is! And then I thought of these trees that could never get the treatment it needs because they dont really belong to anyone - they are just on the side of the road! And how the trees in our yard, we take care of - killing these little boogers! OK... gotta go scratch my head some more now! Seriously, just the title of your post gave me that gagging feeling. But you are right... left untreated they do kill the tree. Left untreated, our sins will ultimately kill us. Great post... great insight!!! And you know how you said you had to point them out to Ricky??? Isn't that sometimes the way with sin... we don't see it ourselves until someone else tells us it is there?! I just wanted to say how very much I appreciated your comment this morning. It is exactly what I needed to hear and it was so supportive. I know I make a lot of jokes on my blog...but on the inside, I guess I'm feeling just as vulnerable as ever. Yep, I officially have the chills! I've never heard of bag worms before! But it's just like you to think of a lesson to be learned by those creepy little things! You see the good in everything! You always amaze me how you take real life stuff and turn it into a wonderful message about God. You have a gift from the Lord. and bag worms are terrible. My hubby kills them and I wont go near them. Ick. Oh, I can so feel your pain with the worms. Great post! I HATE BUGS! I HATE WORMS EVEN MORE! It's comforting to know I'm not the only one who scratches and itches after just seeing creep crawly things. How aweful would it feel and be to know you don't belong to someone?! God's love is so comforting. I really like Lynn's observation too. Love you my dear and thank you for helping to keep us on the right path. Ok that totally just gave me the willy's. And as far as I know we don't have this issue here. There are so many life lessons God tries to teach us through nature alone, if only we would pay attention. I hate bag worms. So far, we don't have any in our yard, but I have seen them around these parts. I wonder if they are attracted to a particular type of tree? Is that what that is? I thought they were just spiders (seriously!). I went to graduate school in KY and saw them ALL THE TIME. What insight. Not many people could see something so nasty and think of God. Amen sister. As far as the worms my 6 year old son would love to watch them grow in out trees. Great post and yes those little critters are giving me the willies! I've never heard of Bag worms and I have to say I am glad! I love how you can take anything, as small as bag worms and use it for God's glory! You really do have a gift! Gross! I never knew what they were.. yuck! 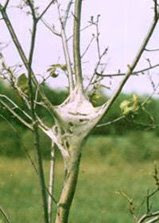 I had them on my tree.. yuck now I am itchy! Aren't those the grossest things ever? I can't stand 'em! Your incredible insight amazes me! amen friend! great post. and i agree yuck on the bag worms. Sick. Sick. Sick. But you made a great post out of it! Seriously they are so nasty. bag worms are soo gross. Uggh. Ewww. I like your correlation & comparison. But ewww! We get those things down our way - not a whole lot...maybe the heat keeps them at bay, but when you do see them - the tree is literally destroyed in no time. Such a shame. Hi, I'm Mary popping over to visit from SITS. You were on roll call just ahead of me today so thought I would come and visit your blog. That is a little creepy. We apparently don't have those around here, or maybe there aren't many of them! The only worms I have are earthworms in my compost pile and they don't bother me at all. Don't worry though, because in the deep south we've got all kinds of other bugs to make up for the lack of these - some will carry you off I swear! Those gnats and no-see-ums, well, it sure seems like it. Ouch! Boy that is so true about sin. I think untreated sin is what causes much of the disdain in our society today. So many people are running around with a bag full of guilt all the time and disconnected from God without understanding that He is the Answer! The ONLY Answer. I can tell ya that since coming into relationship, He has done a work in me. Sometimes it is painful to have that self examination and clarity about our character defects, but peace is always on the other side. Nice insight... LOVE what Lynn said too - sometimes it is so much easier to see the sin in others, but not so much in ourselves. Nice to meet ya and have a wonderful weekend!! i have never seen anything like that. i had to stop reading b/c it grossed me out so much. We call those caterpillars. I've never heard the term 'bag worms'. huh. I remember getting those a lot when I was growing up in TX haven't seen them in a long time though. YUCK!